The seminar part, in turn, focuses is on different manifestations of openness in terms of empirical phenomena described as open such as open source software, open innovation, open strategy or open government. In the seminar, it is the students’ task to analyze empirical cases of openness with a focus on one of the theoretical aspects introduced in the lecture. Given the title and topic of the course, using a closed learning management system was not an option. Instead, I chose to entirely rely an on an open-source-based course wiki to involve students in preparatory tasks and to organize and provide access to course materials. 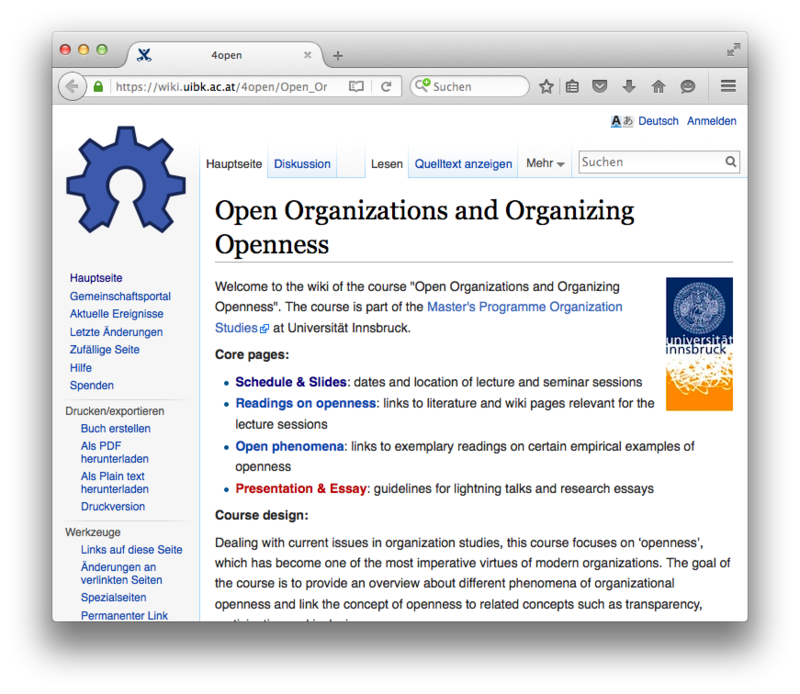 Consequently, all the material on the wiki – in case not explicitly stated otherwise – is licensed under an open content license (CC-BY), making the course an example of Open Educational Resources (OER). However, there are boundaries to the extent of openness that is easily achievable in such a setting. The hurdles are comparably low regarding my slides, which I want to make available both as a PDF and in an editable open format such as ODP. Since I had to design the course from scratch anyway, I just try to make sure that my usage of third-party content either falls under an exception of quotation or education in copyright law or is openly licensed; the latter means that I use the “usage rights” option in Google’s image search to find pictures that were labeled for reuse. The situation is different when it comes to readings. At least in master level courses I prefer to use research articles over textbooks. In this context, open access publications are also a great open educational resource. However, I did not find suitable articles for all topics that were openly licensed or at least openly available at an online repository. The list of readings therefore includes several articles that are only accessible for people at institutions with respective access rights. (I hope to continuously replace those articles with open alternatives but this might take a while). Overall, this illustrates how valuable self-archiving of research articles is with regard to teaching. Researchers who make available their texts on their institutions’ websites or in a repository allow them to be used in the context of open online courses. At the same time, any move towards open access – if not open science – in scientific publishing also implies an improvement in terms of education and teaching opportunities.